I LOVE going to the theatre by myself. Live theatre, move theatre, any theatre. I can sit there and laugh out loud or cry, love it or leave it, and don’t have to worry what the person beside me is thinking. Sure I like going with people too. I’m not completely an unsocial being … yet. Still there is something freeing in going by yourself. I find it odd that some people can’t do it. Why? I suppose I’m use to it from logging so many work trips. I’m a champ at eating alone at a bar too! When you are on the road by yourself you don’t have much choice. Once, while in NY, I left my hotel and went next door to have a drink/snack at a bar. I sat down and ordered then slowly realized I kinda knew a number of people around me. It took me longer than I want to admit to figure out I knew them because they were TV/movie/theatre actors. Eventually the big wigs walked in. Those whose names I could actually remember and my curiosity got the better of me. I leaned over to the guy next to me, some character actor who has been in a zillion of things although I can’t think of one, and asked what was up. 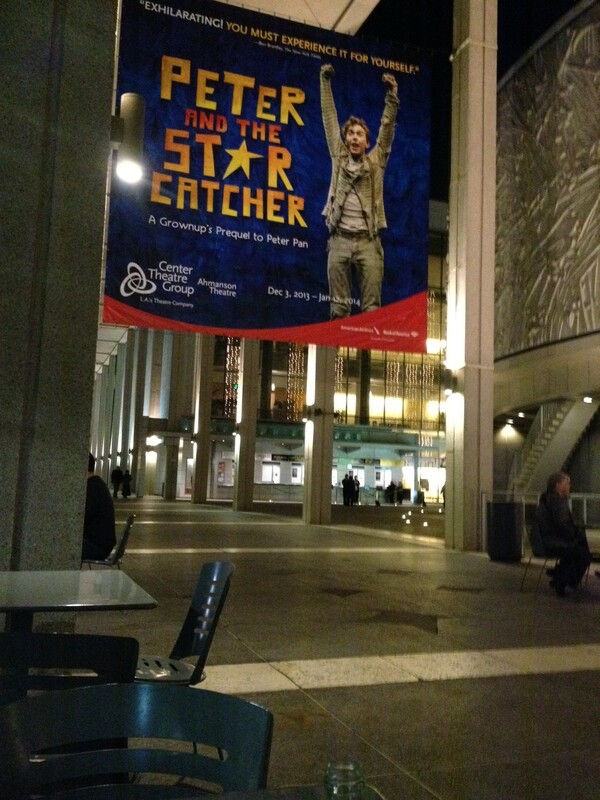 Apparently they had all come from the theatre next door which was showing Peter and the Starcatcher. I was then told by everyone around how brilliant it was and how much I had to see it. Sadly I only had one night in NY that trip before being whisked away via train to CT or NJ or somewhere much less exciting than Broadway. That production went on to win 5 Tony’s and I vowed I had to see it. One day I was driving down Ventura Blvd in LA and saw a banner ad (the kind they put on light poles and are the ad of choice for LA theatres and museums) for the play. It was in LA! I had to go! I refused to even go look at the price of tickets because I knew it would make me sad but then one day it showed up on Goldstar (discount ticket site) and I had no choice. I had to spend the money I didn’t have to go. It had to be done. After all my name is Wendy. It would just be wrong for me not to go see a play based on the life of Peter Pan. So …. last week I headed out to the Ahmanson for some fun. I skipped my normal dinner and drinks before the show to save money and instead headed to the theatre straight from my car (which I parked on the street to save more money — I was really trying to justify the cost of the ticket to myself). The play was wonderful. I hesitate to recommend it since it is a very theatrical presentation (some people walked out … I wanted to hiss at them). There are minimal sets and props instead relying on the imagination of the actors, musicians, and audience. I wasn’t in love with Peter but I found Molly (Wendy’s mother when she was Wendy’s age) amusing and was in stitches whenever The Stache (aka Captn. Hook) came on stage. There isn’t a lot of character arc (except for Peter) but that isn’t why you are there. You are there for the fun. I happily sat there in the theatre surrounded by strangers laughing out loud. LOLing for real! I also think I found my next Halloween costume when the cast came out in their mermaid gear. Brilliant! Much like Wicked it’s fun to see how they tie background and stories into the tail of Peter Pan and Wendy that we are all familiar with. The company of actors were not only adorable but brilliant at demanding you could “see” the boats, island, etc that they were on. Plus there is a dig at Ayn Rand and really nothing makes me happier than that! Not for young children but pre-teens and above should love it. If you have a chance you should check it out.